Feel free to contact if you have any questions or need support. I just received my ring yesterday afternoon (Dome Cut-out Tapered Ring item# R0461) and it's absolutely beautiful!... The quality of the jewelry is as nice as the pieces you will find in a jewelry shop and shipping was fast, too!... Read more testimonials. Find the answer to this and other frequently asked questions abot Hawaiian Gold Jewelry. Hawaii Gold Jewelry .Com is full service online jewelry website offering Hawaiian Heirloom jewelry. Our mission is to provide quality Hawaiian jewelry products and services and practice integrity in all that we do. Over 900+ high quality Hawaiian 14K Solid Gold Jewelry items (made in Hawaii) are featured on our website. View Hawaiian Gold Jewelry collections. Groups of Hawaii heirloom gold jewelry by category. View photos and videos of Hawaiian Gold Jewelry. Hawaii heirloom gold jewelry made in Hawaii. 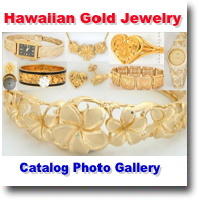 Keep up with the latest Hawaii gold jewelry news and and new products.